Cilmeri is a village in Powys, mid-Wales two and a half miles west of Builth Wells on the A483 to Llandovery. The village is served by Cilmeri railway station on the Heart of Wales Line. 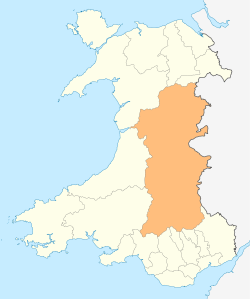 In the 2001 census, Cilmeri Community had a population of 438 and 191 households. The population at the 2011 had fallen slightly to 431. 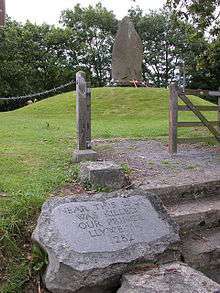 The village is famous for being close to the spot where the last native Prince of Wales of direct descent, Llywelyn ap Gruffudd, was slain in a skirmish by soldiers in the service of Edward I of England, on 11 December 1282. A memorial stone to Llywelyn ap Gruffudd was erected on the site in 1956 and serves as the focal point for an annual day of remembrance on the anniversary of his death. ↑ "Community population 2011". Retrieved 11 November 2015.